In collaboration with Emirates Auction, Abu Dhabi Police, profited over Dh99 million during the public auction which sold off 50 VIP vehicle license plates, class 50. To mark its 50 anniversary, AD police organized this distinguished auction. 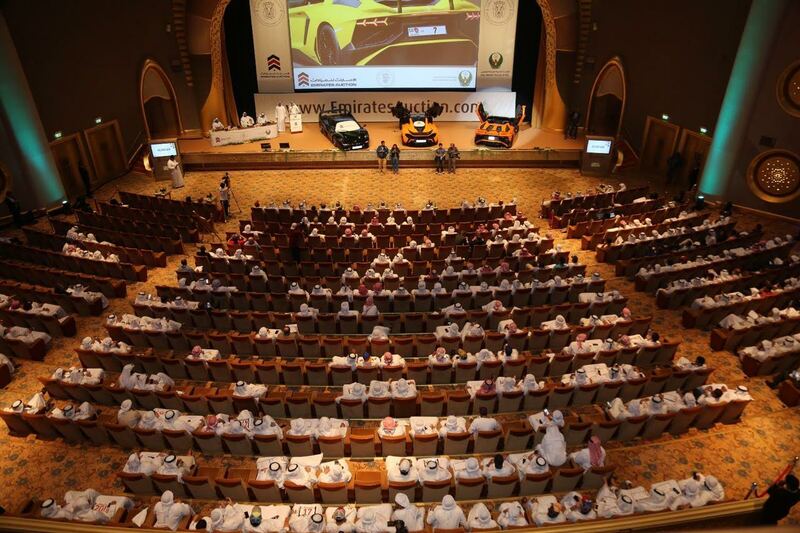 With the attendance of 750 bidders, AD Company License plate No 1 broke the record as the most expensive, fetching a whopping Dh31 million in a fierce bidding in Abu Dhabi on Saturday. The auction was held in Emirates Palace. License plate No 7 came second, sold for Dh13.4 million, in an auction held under the motto of 50 golden years &amp; 50 VIP license plates). The third record went to plate No 50 that sold for Dh6.8million. After a fierce competition of more than 25 bidders, license plate No 11 shot up to Dh6.15 million. The auction #39 success reflects the nationals #39; joy of the Golden Jubilee anniversary of AD government. It #39 an echo of their proud of the milestones and world records accomplished at the hands of The late Sheikh Zayed bin Sultan Al Nahyan (may God have mercy upon him), the founding father of the United Arab Emirates and Khalifa bin Zayed bin Sultan Al Nahyan, the President of the United Arab Emirates, and Mohamed bin Zayed Al Nahyan, Crown Prince of Abu Dhabi and Deputy Supreme Commander of the UAE Armed Forces, said Major General Mohammed Khalfan Al Romaithi, Commander-in- Chief of Abu Dhabi Police. Major Al Romaithi said, we felt how the people were happy and keen on participating in the auction as it #39;s a symbol of the 50 th anniversary of establishing the Abu Dhabi government in 1966, after ZAID AL KHAIR assumed the post of the ruler of the Emirate of Abu Dhabi, then taking office of the country in 1971. We are really proud of the final value of that partnership. The number plate auction exceeded our wildest hopes and dreams, said Abdullah Matar Al Mannaei, Managing Director of Emirates Auction, marking the 50 th anniversary of Abu Dhabi Police. This auction is an opportunity to express our proud and gratitude to our government, especially this is the first time for the Ministry of Interior in the UAE to auction off a limited number of registration plates of new class, told Al Mannaei. We take this opportunity, on this great anniversary, to express our profound appreciation, commend and thank Khalifa bin Zayed Al Nahyan, the President of the United Arab Emirates, along with His Highness Sheikh Mohamed bin Zayed Al Nahyan, Crown Prince of Abu Dhabi and Deputy Supreme Commander of the UAE Armed Forces, for all their great accomplishments which transformed the UAE into its current unprecedented position all along its journey, Al Mannaei said. Al Mannaei pointed out that winners of the plate auction will be granted a certificate of ownership, upon which they have the right of wavering ownership to others. He went further to express his appreciation to the wonderfully joyful atmosphere that prevailed the auction in a way that reflected deep sense of loyalty and proud to our country and its leadership.